Document Management is made easy in ZipperAgent. It allows you to link files stored at Dropbox, Box, Microsoft OneDrive or Google Drive directly to your Opportunities, Contacts or Properties. You can do it by navigating to the Documents related page of these record types. Before you start linking files from these file hosting services, you need to integrate them with ZipperAgent. You should navigate to the Integrations page to add your external document repository accounts to ZipperAgent. 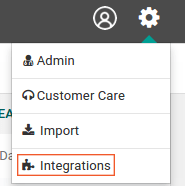 On Integration page, if an external service is not connected yet, it will display a “Connect” button. Once the account is integrated, you will see the integration details (account name) on the icon. Note the name “Will Smith” appearing on the Dropbox service icon in the above picture is the account name that has been integrated with ZipperAgent. In case you want to disconnect any of the services from ZipperAgent, then simple click Disconnect button associated with that connected service icon.